Who is Richard St. Barbe Baker? Richard St. Barbe Baker (1889-1982), the visionary conservationist, proved that individuals can have a positive impact when they take action to protect the ecosphere. In sharing Baker’s inspiring story, author Paul Hanley argues that each of us can make a difference. Richard Baker was arguably the first global conservationist, blazing a trail for contemporary environmental leaders such as Jane Goodall. 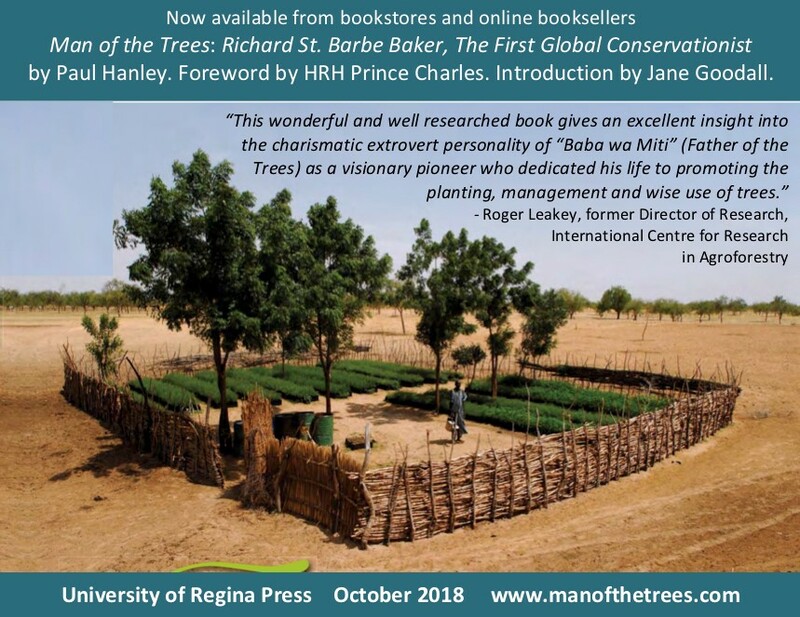 He began his mission to save the world’s forests and reclaim its deserts in 1922, when he launched the first international ENGO (environmental non-governmental organization) Men of the Trees, in Kenya. Baker anticipated problems such as climate change, desertification, and biodiversity loss; he responded by pioneering sustainable development, agroforestry, agroecology, desert reclamation, fair trade, and ecotourism—decades before these practices gained wide credibility. A great adventurer, he travelled the world continuously from 1929-1982, networking with conservationists, lecturing on the need to plant trees to save the planet—and planting trees. In addition to kings and presidents, his extraordinary networks of contacts included leaders of thought, visionaries, and eminent scientists. Baker lived in Canada from 1909-13. He credits people he met at Whitecap Dakota First Nation for inspiring his integrative worldview. In turn, Baker inspired many outstanding figures in the forest conservation and reforestation movement, including Felix Finkbeiner (founder, Plant-for-the-Planet), Scott Poynton (founder, The Forest Trust), Sunderlal Bahuguna (founder, Chipko), Tony Rinaudo (founder, Farmer Managed Natural Regeneration), Vance Martin (president, WILD Foundation), and Hugh Locke (president, Smallholder Farmers Alliance). Through the ripple effect of his indefatigable efforts to promote conservation and reforestation, billions of trees have been planted. 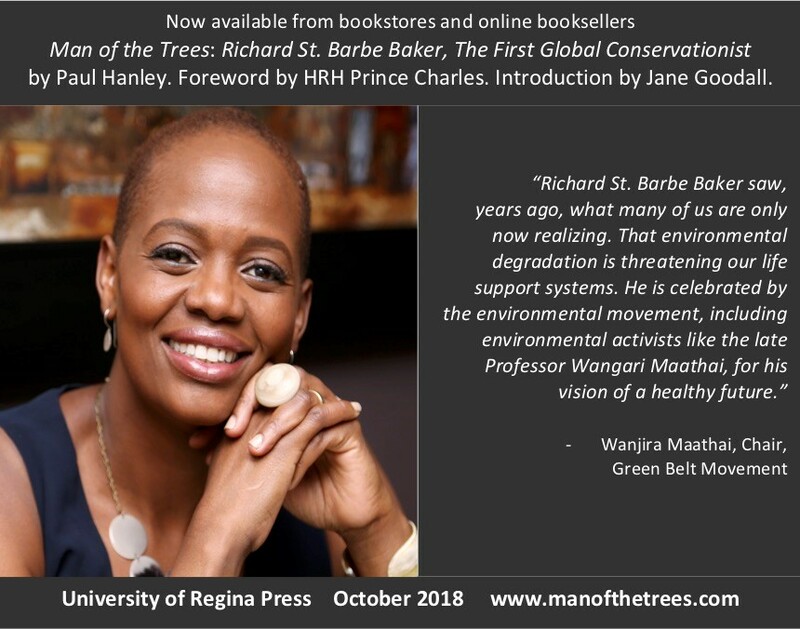 Baker has been recognized as one of the outstanding figures of the conservation movement by environmental leaders such as Wanjira Maathai and Her Honour Elizabeth Dowdeswell. In 1969, The World Wildlife Fund appointed Baker its first Member of Honour. 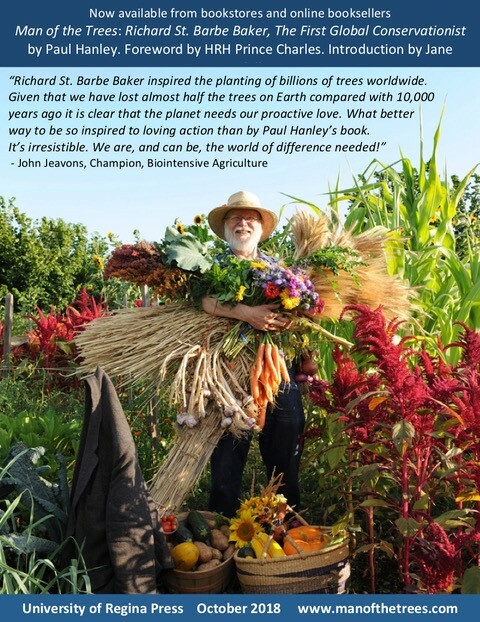 Felix Finkbeiner, Founder, Plant-for-the-Planet - To save our future, we children and youth need inspiring stories like the one of Richard St. Barbe Baker. Every tree helps us to combat the climate crisis. Every touching story makes us change the way we live. Let’s plant a better future! Peter Wohlleben, Forester and Author of The Hidden Life of Trees - St. Barbe Baker was among the first foresters to identify and celebrate the hidden life of trees. He described the forest as a ‘society of living things, the greatest of which is the tree.’ Proof of his keen observation of forest sociability is accumulating. We need more foresters who, like Baker, nurture a deep sensitivity and love for trees. I hope the publication of this biography will inspire a new generation of tree lovers and forest protectors. 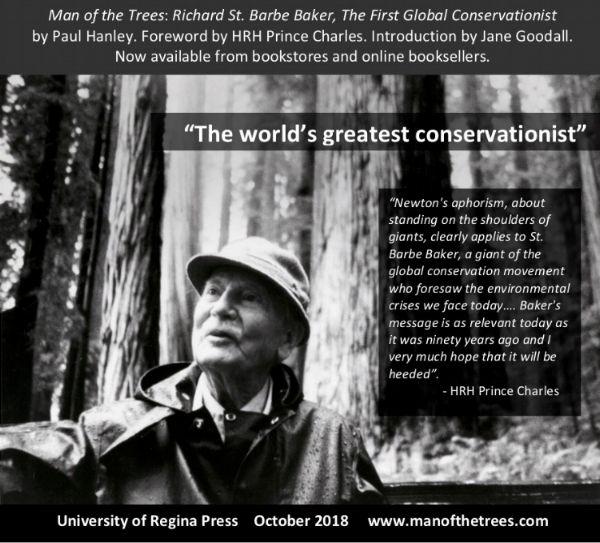 Elizabeth Dowdeswell, Lieutenant Governor of Ontario & Former UN Under Secretary General, UNEP - This biography of pioneering conservationist and environmental campaigner Richard St. Barbe Baker is in part a tribute to a remarkable man, and in part a guidebook for re-energizing our collective efforts to walk more lightly on Earth. 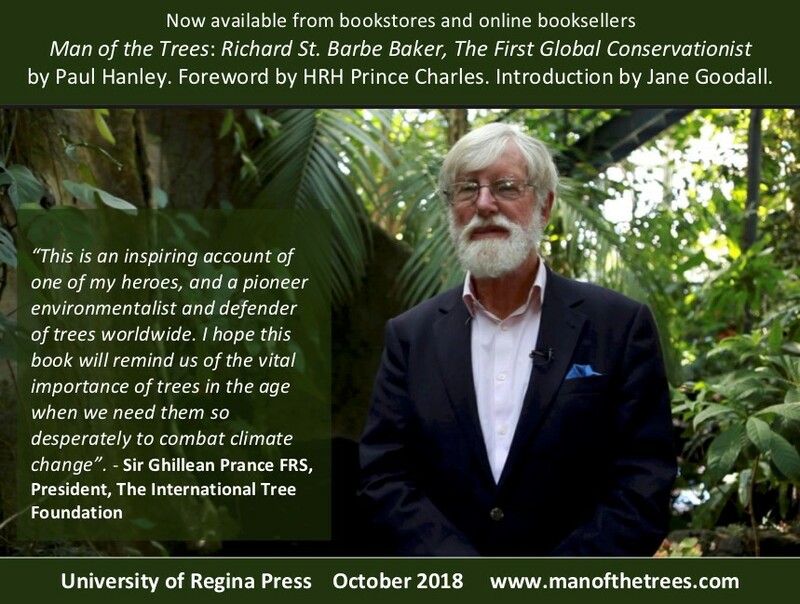 In taking the reader through his life and career, Paul Hanley leaves no stone unturned: thoroughly researched chapters detail the depth and breadth of St. Barbe Baker’s activities to stave off deforestation and ecological degradation. I have no doubt this volume will inspire people everywhere to follow his example. Her Honour, the Honorable Elizabeth Dowdeswell, Lieutenant Governor of Ontario (center), hosted a reception on Nov. 6th, 2018 in honour of the release of Man of the Trees: Richard St. Barbe Baker, The First Global Conservationist, by Paul Hanley (left). Hugh Locke (right) is the trustee of the writings of Richard St. Barbe Baker. Paul Hanley has published five books and 1600 articles on the environment, sustainable development, agriculture, and other topics. He is editor and co-author of Earthcare: Ecological Agriculture in Saskatchewan (1980) and The Spirit of Agriculture (2005). He was environment columnist with the Saskatoon StarPhoenix from 1989 to 2016. Paul is a recipient of the Canadian Environment Award, the Meewasin Conservation Award, the Organic Connections Pioneer Organic Communicator Award, and the Saskatchewan Sustainability Award from the Regional Centre of Excellence for Education on Sustainable Development. His book ELEVEN (2014) received the 2015 University of Saskatchewan President’s Award for Non-fiction and the 2015 ABS North America Award for Distinguished Scholarship.